I want to make it clear right now, I really love this game. Broken Machines is a physics puzzle game in which the player has to use various contraptions in order to guide a marble through each level, with each level designed as certain machines. It's a decent concept, one with a lot of potential both practically and aesthetically. To my delight, Passiveaggresive carried out this concept very well indeed. In terms of gameplay mechanics, there are a good few ways for the player to manipulate the marble's path. For example, the arrow keys control both sliders for the marble to cross gaps and rotating gears which allow the player to carry the marble. The mouse is also used to implement door-like contraptions and more into the game. It is clear that all of these things were placed and tweaked with great precision, as they all work exactly as they are intended to and the description of each of them in the game explains how they work perfectly. So even though the concept requires a wealthy amount of attention to detail in terms of how everything works, this game is bug free. However, this does not mean that the game is error free. One thing which annoyed me personally about the gameplay is that precision is not only necessary on the creator's side of things. Broken Machines is a game which throws you in at the deep end; even the first level can come as a shock to the system in terms of how fast the marble moves and the precise timing needed to correctly get the marble from point A to point B. One tiny mistake in the player's movements can cause the marble to get stuck or simply go the wrong way, and these tiny mistakes may not even seem like mistakes at first. If you're able to look past the initial challenge however, this game can be very pleasing. This is but one frustrating thing about the practicality of the game though, and one could even argue that it improves the gameplay. Sure, it makes Broken Machines much more of a challenge, but it also forces the player to consider every little movement they make, and ultimately causes them to attempt to complete the levels with absolutely no mistakes, with perfection. What certainly impressed me was how the same mechanisms and tricks as in the first few levels combined and came together in the later levels to make new challenges for the player to face. An example of this is how Passiveaggresive combined a slider controlled with the arrow keys with the doors controlled with the mouse. These things make things more difficult for the player, because as well as considering everything before and after the obstacle, one's attention must be on both hands to control both contraptions at once towards the end of the game. The way in which this is done is great, instead of the whole "thrown in at the deep end" feeling from the start of the game, I felt as if the game progressed in a way more like you're being taught what to do, step by step. Of course, the game's not just made up of the gameplay. Visually, Broken Machines is all you could really ask for; simple yet pleasing designs, all based on certain machines (for instance, Level 2 is meant to be and clearly resembles a pistol). This adds to the game more than you'd expect. Some games get away with boring designs and bland colours due to the concept or the plot (such as Out of Time, another game by Passiveaggresive which I'd recommend giving a go), however imagining this game with no mentionable scenery and design really makes the game seem dull. Which is why it was important that Passiveaggresive put effort into this aspect, and that he did. Each level offers a new machine for the player to conquer, a new style of visuals to make moving onto the next level refreshing in a way. It also adds to the feeling of accomplishment when a level is completed that something about the design can change when the player achieves their goal, such as the level designed as a lamp which lights up when it is completed. What really got me about this game though was not necessarily the increasingly complex gameplay or the enticing design, it was the fact that this game is a genuine joy to play. The simplicity, the trial-and-error technique necessary to master each level, the little methods the player can develop for each individual sequence, all of this builds up into what I think is a truly great Sploder game. It's different to other games in a way, as in it's not your generic puzzle platformer which makes you stuck and frustrates you to no end, it's not another RPG adventure which bores you with the same gameplay again and again, Broken Machines is a hidden gem, a diamond in the rough, as it takes one concept and does excellent, enjoyable things with it, and after all, aren't we all just here to have fun playing games? Admittedly this game could be improved though. Ways I would suggest of improving it would be to allow the player more freedom in what they do to help the marble through the machine - all the levels currently offer one and only one clear path for the marble to follow, but I find that the more freedom a game has, the more it appeals to everyone, and because of that this game may not be everyone's cup of tea. 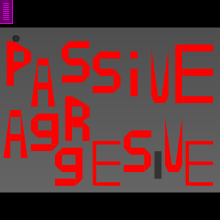 Passiveaggresive could also have explored more complex ideas such as having two marbles or using contraptions operated different ways (the up and down arrows remained unused throughout the entire game). However these are only potential additions to an already great game, not things that are wrong with the game itself. All in all, Broken Machines is one of my personal favourites on the website. At the time it was made, it was a surprisingly original idea and the quality at which it'd been executed gave it a real lasting appeal, enough for me to be reviewing it a good two and a half years after it's initial release. So although not everyone may love it quite as much as I do, it's still a challenging and wonderfully satisfying game to beat, and I would recommend to absolutely everyone on the site to play it. Passiveaggresive's Broken Machines gets a 9/10 rating from me. I have been Paradon, thank you for reading my review.